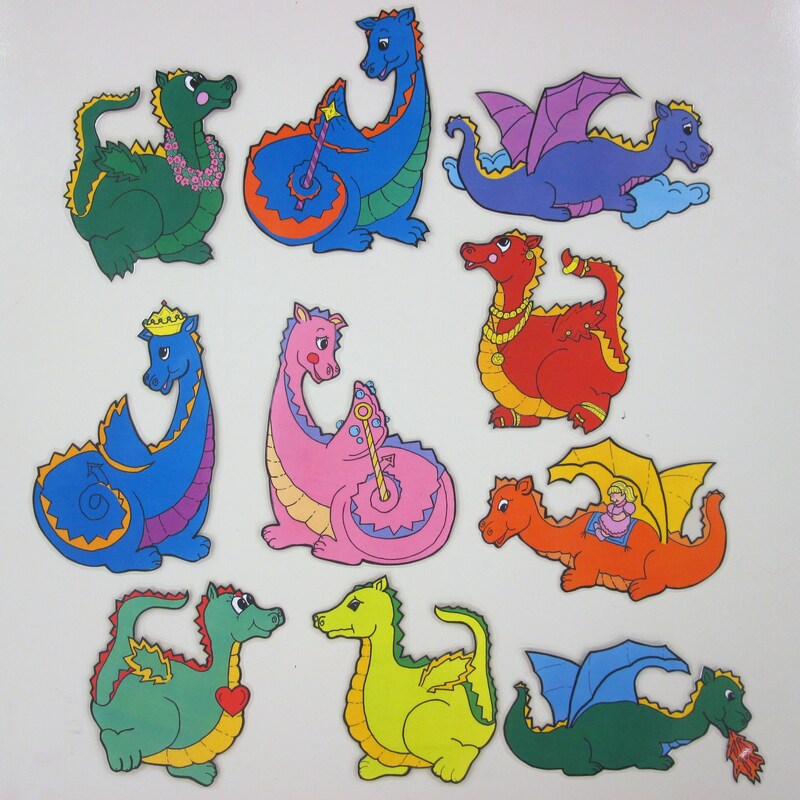 Today’s theme was all about dragons, princesses and knights….but heavy on the dragons. I replaced the difficult vocab words in this poem for my preschool class. I put the words I used in parentheses. And guarding vast caches (great treasures) of gold. I told my class that I brought my magic wand with me to storytime today. “And when I wave my magic wand, everyone must do what it says! My magic wand says Jump!” I have my magic wand say things like: touch your toes, wiggle your nose, clap your hands, stomp your feet, touch your elbow, touch your elbow to your nose, spin around in a circle….sit down! 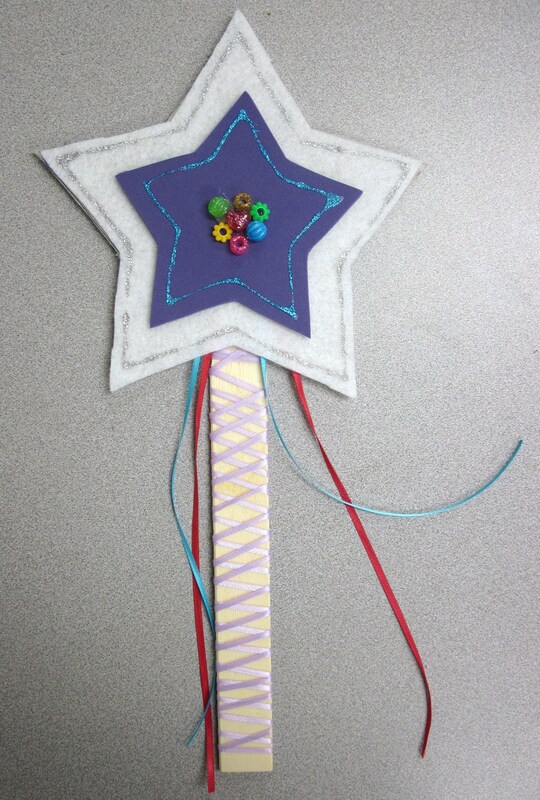 I made my magic wand by cutting a star out of cardboard and covering it with felt and craft foam. I glued the star to a paint stirrer, and decorated with ribbon, beads and glitter. Princess Justina Albertina is a very spoiled princess who is used to getting her own way….and when she doesn’t get her way she throws horrible tantrums that give her nanny headaches. When the princess asks for a new pet, her nanny searches to the ends of the earth – literally – to find her her perfect pet. The princess is not easily pleased (Note: if you are low on time or attention span, you can skip a few pages of pets – she goes through a long list! ), but when her nanny returns with a giant gryphon the princess declares him “just perfect.” However, we find out that this is not a happy ending for Princess Justina Albertina – this story is a cautionary tale, warning about the dangers of acting like a spoiled princess. Original words and templates are from Super Storytelling by Carol Elaine Catron & Barbara Catron Parks. **If you do not have access to the book Super Storytelling for the templates, Daily Art Hub has some cute Dragon Clipart for $2.99. Ten dizzy dragons lived long, long ago. In a land filled with magic where few people can go. The first dragon wore a garland of flowers. The second dragon had strong magic powers. The third dragon flew wildly through the air. The fourth dragon lived in a jewel-filled lair. The fifth dragon liked to blow pretty bubbles. The sixth dragon rescued people in trouble. The seventh dragon wore a crown made of gold. The eighth dragon had a heart brave and bold. The ninth dragon was very sad – he was a bit of a crier. The tenth dragon breathed smoky red fire. In a land filled with magic where in your dreams you can go. After reading through the rhyme, point to different dragons and ask your audience if they can remember what each dragon did (…wore a crown of gold, blew bubbles, rescued people etc.) It’s a fun memory game and it’s a good test of their listening skills. On the back of each dragon, I wrote the words to the rhyme corresponding with that dragon. I also numbered them according to the order they appear in the rhyme. That way I don’t have to read from a sheet or memorize the rhyme – all of the words are right there in front of me while I’m showing the dragons to the audience. Easy peasy. Psst! I’ll share with you my new favorite coloring short-cut: I scanned the black and white dragon templates onto my computer, and then “colored” them using Paint.NET. I’m not sure if I’m clever, or just incredibly lazy, but I’ll definitely be using this technique again! This book comes with an audio CD, so I used the CD to sing this book instead of reading it. The tune is catchy and the pictures are bright and colorful. The CD also has a version of the song without words, so if you have great timing and a good singing voice you can use the CD simply as accompaniment. I am not this talented and had to use the version with words. 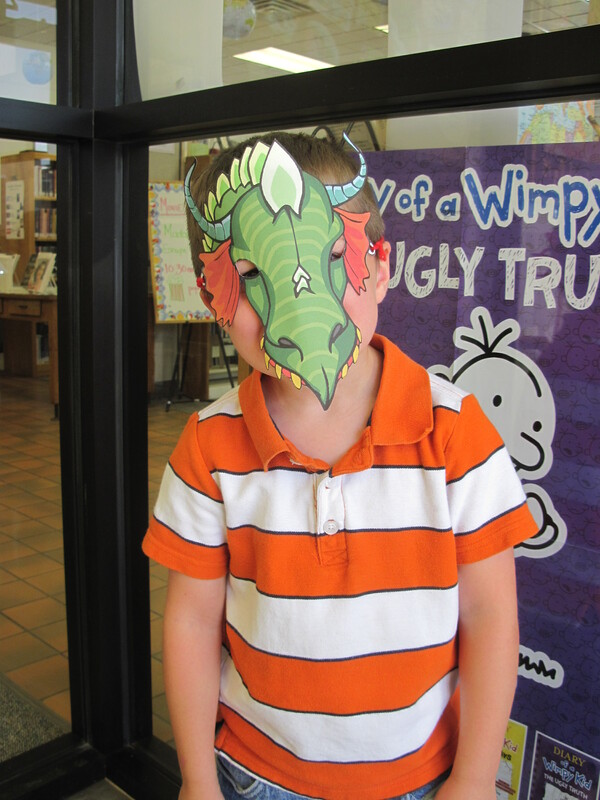 Printable dragon masks, in color and black & white, are available here on Animal Jr. A simple craft – all you need is the coloring sheet, scissors, and yarn to tie on the mask. i just love so many of these ideas! i used them with my 3 yr old today in our D is for Dragons day. I love the 10 Dizzy Dragons story and would like to make the dragons to use during Storytime. Can you post the templates or link to the templates? I haven’t been able to locate them on the Super Storytelling website. Thank you! Good question! I get so many requests and comments about the Ten Dizzy Dragons flannelboard! Unfortunately, since the flannelboard templates are part of a published book, the material is copyrighted. And sharing it online would break copyright law! I actually requested this book through my library’s interlibrary loan program. To anyone trying to locate Super Storytelling: I would highly recommend trying to locate a copy through your local library and/or interlibrary loan. If you aren’t able to locate a copy, please send me a message through the “contact us” tab at the top of our website or leave a comment on this page. Make sure to sign in or include your email so that I can get back in touch with you!